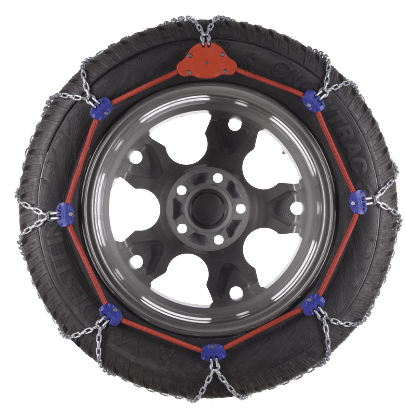 What type of snowchains to choose ? 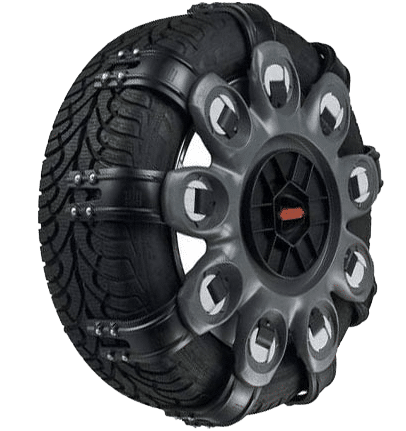 In case of heavy snowfalls, or in the absence of snow tyres, the use of snowchains can be mandatory in some regions subjects to regulations on winter equipments. There are snowchains for all budgets and for all uses,but which do you have to choose? Pneus Online will help you with that mini sales guide. The snow socks are meant for a limited or emergency use. Their main advantage is that they don't damage the rims and don't interfere with the electronic sensors on the wheels.And above all, their fitting is extremey simple and fast as they need to be fitted like covers on tyres. The maximum speed with snowsocks is 30 mph. Invented in Norway,their surface has texture and is permeable, wich create an effect of "dry friction": the water at the surface of the ice is absorbed and thrown away,which allows a direct contact between the textile and the ice. This friction,combined with the electrostatic field, allows the grip and insure good driving and motivity. Snowchains are however meant to be used when there is lots of snow or for an emergency use (to get out of a path full of snow). They must be withdrawn on dry road to avoid damaging them. The metal snowchains are absolutely mandatory for a intensive and regular use in the mountains. Their main advantage,other than their grip,is that they are particularly resistant. The chains have to be fitted on the two driven wheels of the vehicle(exept for the propultion cars and 4x4 where it is recommended to fitt the chains on all four wheels). The maximum speed with snowchains is of 30 mph. They are "calssical"chainswho demands a certain dexterity and a little practise before fitting. They need a second stop to tighten again the chains. Their advantage is their price as they are the cheapest option. It's recommended to practise fitting them before you need to use them. Very handy,these metal chains are fitted in less than a minute and you don't need to stop to ajust the tension as their innovative system adapts automatically the tension as the vehicle will be in motion. As efficient as the chains with manual tension, they are however more expensive. It's a chain between the metal chain and the snowsock as it's composed of ultra resistant polyester chains and steel collars. They are approved. Efficient on snow as on ice, they are fast to fitt as they have to be used as a tyre cover on the tyre. The maximum speed with that type of chains is 24 mph. Their price is the same as the chains with automatic tension, but unfortunately they are not available in all dimensions. It's the best snowchain: easy and fast fitting, they don't damage the rims and last longer than the other types. They are in the shape of an octopus or spider with claws and studs that allow the best grip possible as on snow than on ice. Pivoting levels allow them to adapt to several size of tyres. They can also be fitted on vehicles that have a narrow space between the wheel and the arch supension. They are the best option for persons that frequently drive in extreme climatic conditions. You will need to purchase an adapter and they are more expensive than chains and socks. For each use and each budget your snowchain. If you live in a region where it doesn't snow regularly, or for an emergency use, choose the socks, they don't take a lot of space and there are easy to fitt. If you drive frequently in high mountains,to access at the slopes and in case of absence of winter tyres,the metal chains are essential ! It's your choice if you prefer a manual or automatic tension. Find all types of chains available in your dimensions.